Ss the nation’s opioid crisis spirals into ever-more risky territory where synthetic painkillers get mixed with illegal drugs with fatal results, reporters are digging deeper into how drug companies got the country into this mess and cities now are stepping up with different approaches to curb deadly overdoses. Vox, an online news and information site, reported that experts aren’t sure why, but they’re seeing an ugly trend in users and dealers mixing fentanyl, a synthetic opioid and sometimes legally prescribed painkiller, and other illicit narcotics, notably cocaine and heroin. Vox reporter German Lopez, in interviews with drug experts, finds they are divided: Some think the deadly mixtures are occurring on purpose, with users seeking even greater intoxication or dealers promoting this to them. It may be that the mixtures are occurring unintentionally, as fentanyl, even in the tiniest amount as a residue, packs a wallop. Or it may be that authorities, as they try to get a better handle on the opioid crisis, have developed sharper data on drug abuses. Whatever the reason, the mixtures are causing a spike in overdose deaths, both in their sheer number and the cases in which fentanyl, coke, and heroin in some combination are implicated in fatalities, Vox reported. This trend also underscores the importance of attacking not just opioid addiction alone but a range of drug addictions, experts quoted by Vox said. The rising toll of fentanyl, inevitably, also makes a New York Times magazine story more upsetting, as it details the doctor-based scheme involving Insys, a major company that hustled a purported product for cancer pain. The drug was Subsys, a form of fentanyl that supposedly was easier to administer and control because it was given as drops under the tongue. It fast moved from a niche therapy for severe cancer pain to a best-seller, prescribed for an array of pains, large and small. The magazine tells a somewhat familiar story of Insys CEO John Kapoor and his zeal for marketing medications to enrich himself and those around him. With Insys and Subsys, the magic formula centered on physician venality, the New York Times says, as it describes how the drug maker bet big and often on luring doctors into shady practices in the guise of expert speaking deals and professional-to-professional marketing. Prosecutors use a term familiar in crime but not necessarily in medicine to describe the elaborate back-scratching: kickbacks. In my practice, I see not only the major harms that patients suffer while seeking medical services but also the huge toll inflicted on them by dangerous drugs, notably opioids and potent synthetic painkillers like fentanyl. Experts argue that prescription painkillers served as gateway drugs, with their addictive high and often accumulating higher costs leading patients to ever more powerful and dangerous options, including illicit fentanyl, as well as illegal coke and heroin. Federal officials, in a precursor of a fast-rising death toll from opioid abuse, reported that emergency room treatment of opioid overdoses spiked by 30 percent across the nation in 2017. Abuse of opioids, including the synthetic painkiller fentanyl and heroin, also is triggering significant outbreaks of diseases, including hepatitis C, which is costly to treat, and deadly major bacterial infections. In 2016, federal officials found that almost 64,000 Americans died of drug overdoses, two-thirds of them from opioids. That’s a rising toll that makes overdoses the leading cause of death for Americans younger than 50. While Uncle Sam continues to take fire for a pokey, inadequate response to the opioid crisis, other levels of government, including states and now cities, are stepping up. Los Angeles has joined hundreds of city and state governments that have sued drug makers accusing them of fueling the opioid crisis with unacceptable marketing claims based on little or no evidence and lax oversight of distribution of their risky products. City Lab, a web site that covers urban centers and their innovations, also has posted a piece describing how, at a low and close government level, municipalities have stepped up to attack the opioid crisis in their own distinctive ways. 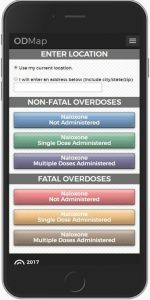 These include a campaign, focused on first-responders’ use of a mobile app (shown above), to better track opioid abuse and deaths in the Baltimore-Washington, D.C., area and elsewhere. Authorities say that drugs move through a regional trafficking corridor, and only by getting better, faster, and more detailed data can they see how to smash illicit drugs sales and distribution, and, thereby, to curb abuse and deaths. In Anne Arundel County, Md., City Lab says, officials not only have set up programs to make fire and police stations “safe” spots where addicts can get reliable information and speedy treatment, they’re also cooperating, particularly in Annapolis, to develop technologies and cooperative communications to find treatment spots for those abusing opioids and other drugs. As a nation, we find ourselves deep in an opioid mire and we have a far way to get out of it. But it is good to see that a major threat to Americans’ health and well-being is getting the attention needed to start to deal with this significant problem.